Wolf’s story addresses something that matters to every one of us: the compelling theme of home, and how all of us are shaped by it. PETER M. WOLF is a nationally recognized author, land use expert, and investment advisor. The author of six previous books, his new memoir My New Orleans, Gone Away, which reached The New York Times e-book best seller list, captures the fabled town of his youth and delves into the aspirations, expectations and disappointments of his post-war generation. The narrative incorporates themes of identity, love, and longing bound into the story of his family, education, romances and career. Celebrated author and historian Barbara Goldsmith describes My New Orleans as "A heartfelt, intimate, and painfully honest account of the coming of age of one shy boy and of the exotic city he left behind, but will never forget." Sidney Offit calls it "the triumph of a memoirist with the eye of an architect and the heart of a poet." A Yale, Tulane and New York University graduate, after earning a Ph.D., Wolf was elected Chairman of the Board of Fellows of the Institute for Architecture and Urban Studies in New York, and appointed Adjunct Professor in the School of Architecture at Cooper Union. Over the years he has earned a Fulbright Fellowship, received honors, awards and grants from the National Endowment for the Arts, the Ford Foundation, the Graham Foundation for Advanced Studies in the Fine Arts, and twice been selected a Visiting Artist/Scholar at the American Academy in Rome. 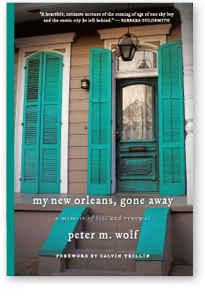 Wolf's philanthropic activities began immediately after college when he served as a trustee of the New Orleans Public Library and the fledgling New Orleans educational television station. More recent commitments include Founder and first Chairman of the Thomas Moran Trust, and trustee in New York City of One to World, and in East Hampton of Guild Hall and the Village Preservation Society. He is a past Chairman of the Van Alen Institute and served as an advisory board member of the National Academy of Design. Peter Wolf Associates, Inc. provides investment management services on behalf of a individuals, trusts and families. His hobbies, avocations and digressions include playing tennis, making watercolors, traveling to remote places, biking, canoeing, and kayaking.